TL;dR: I love MOOCS. To me, their value is clear: The opportunity to learn and participate in a subject of my choosing, being able to expect a worldwide, inquisitive class, with all that it offers. For many, online learning is a solitary affair, but I find the missing community layer one of the most compelling works to yet be built. In this post, I’ll discuss my thoughts on MOOCs, their advantages and shortcomings today, and a few aspects where they need improvement. MOOCs–Massively Open Online Courses–are relatively new in the ed-tech scene, having come into being a mere three years ago, pumped full of investor capital with much fanfare of disrupting higher learning, and delivering access to education at a fraction of the cost of traditional learning institutions. Following from smaller scale experiments in open course ware, and successful massively online services like the Khan Academy, MOOCs were heralded as a way to reduce the growth in cost of education, to expand access, and bringing new tools to our most troubled students. Many of these promises are far from being delivered, raising concerns from investors, after all, many of the highest profile MOOC providers are for-profit–seeking to cash in on the revolution, one that’s been much quieter than the most eager had hoped. As a veteran of a few MOOCs, I’ve found them compelling offerings of education previously locked away behind admissions doors and geographic bounds, but I feel equally that there is more work to do, to answer many of the questions that add uncertainty to the MOOC movement. As of 2015, MOOCs have yet to accomplish their goal of revolutionizing learning, at least for the masses, prompting discussions around where they are encountering difficulty, and whether the business model is viable as currently implemented. Comparisons are often made between real-life classrooms on statistics such as enrolment, completion rates, grates, and test results. It’s under this backdrop of questions around profits business models that for-profit MOOC providers will be judged, and will ultimately live and die. Questions around the true financial value of MOOCs, and whether or not people will actually pay for them, will need to be answered by current players need to do to justify their current valuations. Still, for a substantial core, open course ware is part of the broader social movement of our generation that desires to make information open and accessible, and will likely fight to keep it that way. MOOCs provide massive global reach and scale of audience that traditional universities will likely struggle to match via traditional instruction. It is unlikely that these prominent universities will ever reach all these students in scale in real life, but thanks to online instruction media, it is possible for one to take the same microeconomics course I took as an undergrad as a MOOC (even taught by the same professor). And the same course, that once taught a few hundred, now teaches 6,500 students worldwide, and that’s just for this term. Some of the most popular courses have attracted ten times that–a stadium full of participating students. Incredible! Of course, not all will complete the course, and the quality of the learned education is much more variable given the absence of rigorous testing/validation, but I highly doubt that a dedicated person intent on learning the material would be worse off from taking this version of the course, versus the sit-in course that I took a decade ago. In fact, I’d even say it’s easier today, for the inquisitive self-motivated learner to find supplemental material to continue their learning; so today’s MOOC learner may be even better equipped with knowledge. Importantly, by being free, and open without any barrier to all, it’s possible for more than just accepted students of Illinois to take this course, and rather, is open to the entire world. Given this, I can see how 6,500 seems disappointingly small, we must not forget that it’s a HUGE amplification in reach. “Revolutionary” isn’t hyperbole when you’re able to teach 40x as many students as you did previously. It is said that the primary value of MBA programs are the lasting real-world connections you form through class and extracurriculars. For reasons obvious, there are some challenges to this in a purely online media. However, as the rise of internet culture has shown, it is completely possible to create lasting connections from common interests, and what better common interest than shared intellectual pursuits? This is highly lacking in today’s MOOC landscape, where various fora typically make up the extent of discussion in the community. Despite being highly leveraging social media connect platforms to sign you up and share, none of the MOOC providers have bothered to take advantage of network effects by investing into a social layer on their site, particularly one that lasts beyond the scope of the classroom forum. It would be great if there was a better way to formalize such connections. I’ve seen this used very effectively on sites such as Quora, Reddit, StackExchange, and other sites which effectively build out and incentivize an engaged community. Off-site interaction is encouraged at times, but are relatively rare, and are often class specific and do not offer continuity beyond the scope of the teaching. While this may be deliberate to keep things focused on education, it seems a huge oversight to get a bunch of intellectually curious people in a virtual classroom, but not provide easy means to connect beyond it. There isn’t even a means to message other users, or tell them apart from class to class. It’s a shame, because users are already coming up with their own ways to cultivate community that is absent, including offline blogs, various discussion and review sites, ad hoc social network groups, showing a clear desire and need in the market. If it is the intent of these for-profit MOOC providers to capture this attention and added value, they haven’t really done so too well. I’d love to see the creation of a meta-layer learning community, bringing to life a lasting social layer to the learning environment. MOOCs provide incredible opportunities for learning, but so far, it doesn’t come with the weight of a university’s recognition. I don’t believe this needs to be a barrier for MOOCs–as educational tools develop, I believe the quality gap in instruction can be eliminated or even reversed, and that recognition can be had in other demonstrations of learning than a course certificate. That said, I feel the internet provides a great many other ways to help differentiate you and demonstrate your learning far more than a piece of paper with a generic signature can. The true value to show is the to display one’s autonomy in self-directed learning, and ability to synthesize it in applications, and for someone like me, who uses MOOCs to accelerate an area of interest for which I’m already researching, that works perfectly. For other motivations, like Laurie from the No-Pay-MBA blog, who is trying to replicate the academic side of a business school degree, there are more clear requirements that may reveal gaps in what courses are offered at any one time. That said with a vibrant community, I believe that an effective curricula can provide a great guide for an education, and we should recognize that very little cannot be learned from other sources. To my earlier question, will the model of MOOCs survive? As for-profit enterprises, the causes for disillusionment from investors of platforms are obvious. That said, from a perspective of values, MOOC platforms are incredible educational tools that simply were not available before 2012, and are clearly yielding value to the community that takes them. I would like to see the rise of a non-profit MOOC platform as the dominant model for delivering content, but I’ll leave it to whoever can deliver the best experience. Some turmoil can be expected in the market as investors re-think product-market-fit, but I see the movement of MOOCs continuing broadly. They provide excellent marketing for the universities, are highly engaged on as platforms, and provide clear value to students invested in it to learn. The multiples are so incredibly high that it’s a surprise that it’s taken so long for education to get to this point. More realistically, I see MOOCs fitting in with sites like SkillShare, embraced by those seeking to learn and engage a community. 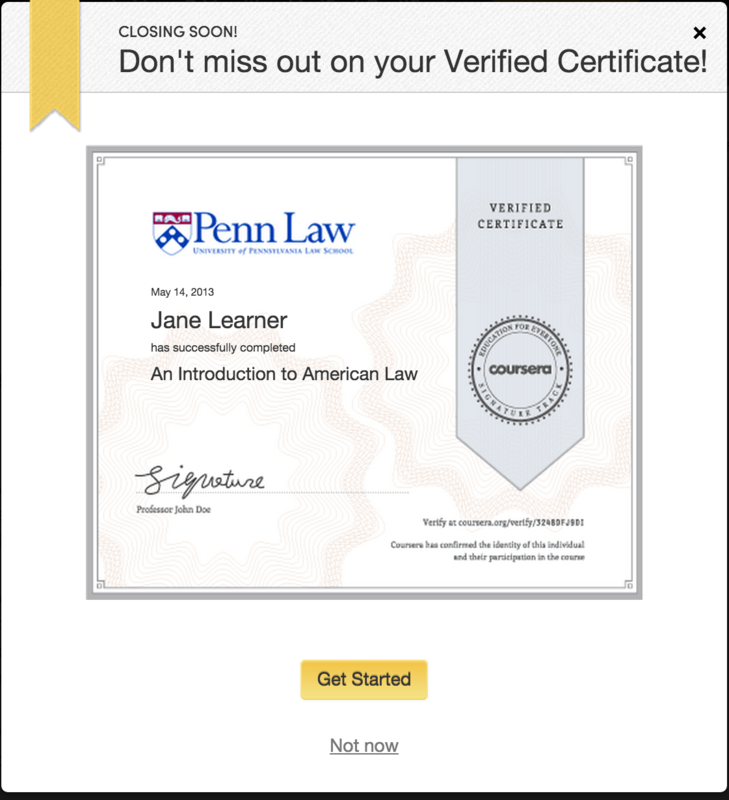 Perhaps a level of certification of learning could be next–I could imagine Coursera offering “verified” testing centers. While the definitions are debated, I see MOOCs as being part of a broader movement of open information. This means their core material has to be accessible to all, regardless of geographic boundaries, and at no cost, and without barrier. Note that platforms can provide added value and charge for them, but in principle, like the open source movement, “the stuff that matters” should be free, and without barriers of access such as admission, completed prerequisites, GPA, etc. Platforms tend to work very well as enablers of community, and current platforms need to do more to foster it to bring engagement. Most course providers thus far have chosen to do so via course specific forums and occasional use of external communities. I’ve seen a heavy use of Google+ for both classroom continuity and mass-Google Hangouts (allowing previous semesters to continue to engage with future students and the ever-growing community) for office hours. 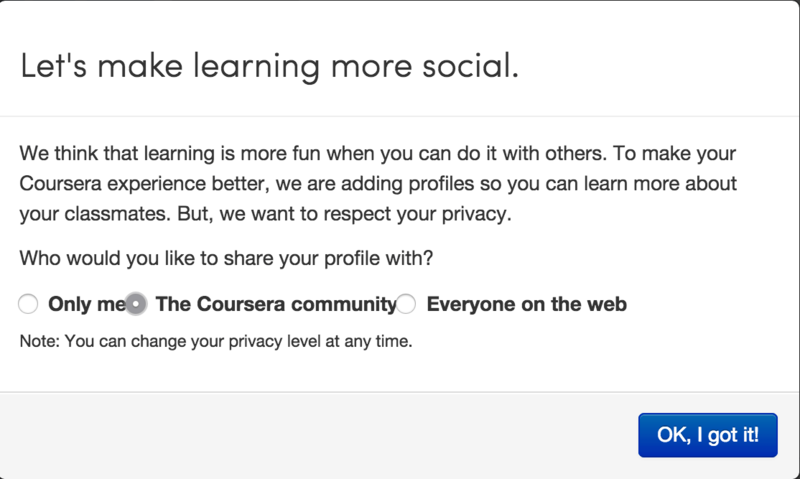 Perhaps MOOC providers could find a place where they can add further value via an internal social layer. In my next posts on MOOCs, I will write about the courses that I felt were highly informative, and even entertaining. Far better than most television one might be watching.